Hummus is a wonderful food. Especially if you make it homemade yourself. You can control the variables that tend to make this food unhealthy, such as the amount and type of oil you use. I love eating hummus for lunch as it provides protein for staying power and the opportunity to use fresh veggies as the conveyor to my mouth! Double win! Place all ingredients into a food processor. Blend until smooth and creamy. Store in refrigerator until use. I agree - hummus is awesome! And so are avocados so I'm really liking this recipe. I make a lot of classic hummus, but adding an avocado sounds like a fabulous twist---definitely worth trying! Looks delicious! And this version with avocado is brilliant! Thank you! I just learned that if it stays in the refrig for very long, it may turn brown. Adding a bit more lemon may help. We usually eat it so fast there isn't any to oxidize! I'd love to see your recipe! I am so in love with avocados right now... I am quartering them at breakfast and spreading them on toast like butter. Yum. I love hummus and would love this version! Hummus from scratch is always a great choice! Awesome and thank you! So sweet! Yum hummus is my go to snack food! Love the healthy fats from the avocado!! P.S. All those "Sunday Supper" type comments are trackbacks. When folks update their links, my blog gives me the option to approve those links and show them with my comments :) It's good for SEO! 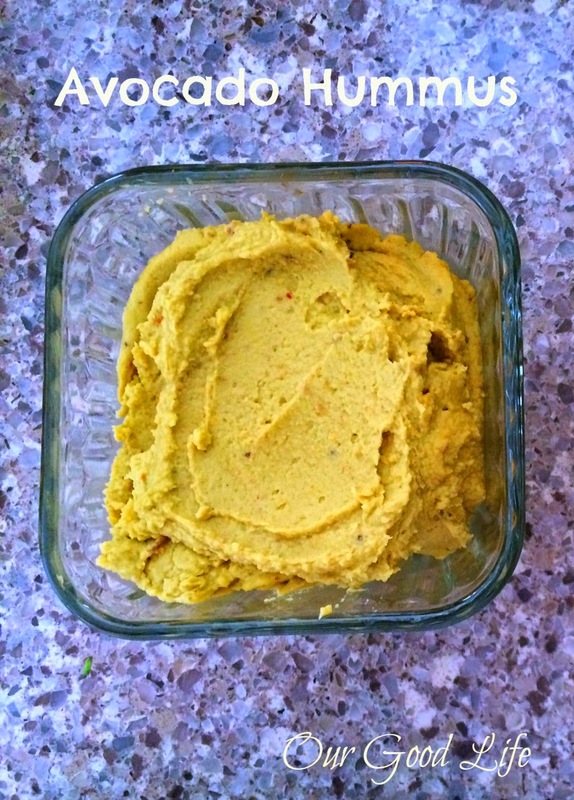 So simple and a great flavor variation of hummus! Agreed. The healthy fats are so filling and tasty! Two things I LOVE: avocado and hummus! This looks delicious! Hummus and avocado works for me! This sounds like a way I'd actually like avocado! Not a fan of guac but love hummus! LOL, yep! I spread it on sandwich, two toppings with one swoop of a knife! The avocado is there, but subtle. Let me know if you try it! I agree. I can't decide if it is cheaper, because I always buy it from Aldi's, but when I go to a different store, at $5 a container, I think, wow, I make it a lot cheaper! Yum. I love hummus and I love avocado, so this is a perfect recipe. What a great start to Sunday Suppers. Love the addition of avocado. I have a pretty strong dislike for avocado, but my hubby loves it ... and he loves hummus too so I will have to make this for him! Welcome to Sunday Supper! Love a great dip like this one!! I used to eat avocado hummus by the tub full until I developed an allergy to avocado 😒 Yours made me remember how much I miss it! Oh and I am in love with Wilson! I have a Westie named Angel! !